Morihei Ueshiba (14 December 1883 – 26 April 1969). Philosopher, martial artist, author, and the creator of the discipline of Aikido. He is often referred to as O’Sensei (Great Teacher) by aikidoists. Morihei Ueshiba was born in Tanabe, Wakayama Prefecture, Japan on 14 December 1883. During his childhood, the Ueshiba family lived in Maizuru (Kyoto Prefecture). His interest in martial arts stemmed from witnessing a beating of his father which affected him deeply. However, it was only after moving to the northern island of Hokkaido in 1912 with his wife, as part of a settlement effort, that his martial art training took on real depth. For it was here that he began his study of Daito-ryu aiki-jujutsu under its reviver Takeda Sokaku. After Ueshiba left Hokkaido he came under the influence of Onisaburo Deguchi, the spiritual leader of the Omoto-kyo religion in Ayabe. 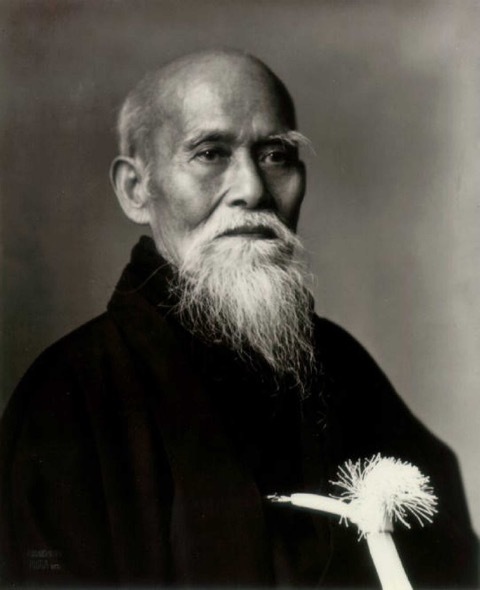 In addition to the effect on his spiritual growth, this connection was to have a major effect in introducing Ueshiba to various elite political circles as a martial artist. The Ueshiba Dojo in Ayabe was used to train members of the Omoto-kyo sect. He was involved in the first Omoto-kyo Incident, an ill-fated attempt to found a utopian colony in Mongolia. Morihei Ueshiba died on 26 April 1969.